View More EventsAn error has occurred, which probably means the feed is down. Try again later. POCATELLO — Idaho State head football coach Rob Phenicie draws much of his inspiration from friend and colleague Bobby Hauck, head football coach at the University of Montana. The most unique piece may be Hauck’s love for special teams. Phenicie and the Bengals held a special-teams only practice Tuesday at the ICCU Practice Field — something ISU has done once each spring and each fall since Phenicie was hired in 2017. The team touches on special teams every practice, but Tuesday’s session and ones like it give extended attention to the most-overlooked part of the game. Idaho State’s softball game against Boise State schedules for 3 p.m. Tuesday at Miller Ranch Stadium has been canceled due to weather. The game will not be rescheduled. 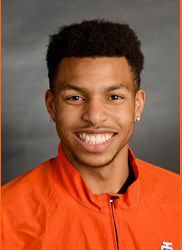 Idaho State’s Treyshon Malone was named the Big Sky Conference’s Track Athlete of the Week on Monday. Malone won four individual events last week at the 2019 Aggie Invitational in Logan, Utah. To win the 100-meter dash, Malone ran a personal-best time of 10.44 seconds. The mark ties him for sixth all-time in the ISU record book. Malone also set a new PR in the 200, winning the sprint in 21.15 seconds. He finished the weekend by winning the 100-meter hurdles in 14.59 seconds and took first place in the long jump by leaping 7.36 meters (24 feet, 1.75 inches). Malone and ISU continue their season Saturday at the MSU Bobcat Invitational in Bozeman, Montana. The three finalists to become the next men’s basketball head coach at Idaho State University have been unveiled. Either Gus Argenal, Saul Phillips or Ryan Looney will be the Bengals’ next coach, ISU Athletic Director Pauline Semons Thiros confirmed Monday. The three candidates made the cut after 13 interviews were conducted at the NCAA men’s Final Four the weekend of April 6 in Minneapolis. Argenal, a former Nevada assistant coach and head coach at Division II Cal State East Bay, visited Pocatello on April 10. Phillips was on campus Sunday, and Looney made his visit Monday, Semons Thiros confirmed. The Idaho State softball team dropped a doubleheader at home Friday to first-place Weber State, losing 5-0 and 9-1 in five innings at Miller Ranch Stadium. Weber State is now 9-0 in Big Sky Conference play while the Bengals dropped to 4-6 (14-22 overall). Idaho State was held to two hits on the day. Autumn Pease took the loss in circle in the opener as she allowed five hits, five runs (two earned), two walks and struck out four. Mariah Mulcahy took the loss in the nightcap. She went three innings, allowed six hits, nine runs (seven earned), and five walks while striking out two. Mailee Newman pitched the final two innings. In game one, Weber State scored three runs in the fourth inning and two in the fifth inning. Weber State had its five runs on five hits. Jayden DeMoss had the only hit for Idaho State. The Idaho State track and field teams concluded day one of the 2019 Aggie Invitational in Logan, Utah. Ashley Sondag won the women’s 5,000-meter run with a time of 17 minutes, 58.38 seconds. The Idaho State men took the top two spots in the hammer throw. Trevor Jensen won the event with a throw of 57.26 meters (187 feet, 10 inches) and Leo Finsterbusch finished second, throwing 55.49 meters (182 feet, 01 inch). In the women’s hammer throw, Taylor Clark finished third with a mark of 49.03 meters (160 feet, 10 inches). The day finished with Anna Gardom winning the javelin throw. Gardom threw a distance of 43.95 meters (144 feet, 02 inches). The meet continues Saturday at 10 a.m. (MT).